British serial adventurer James Ketchell is now en route to the first ever world circumnavigation in a Gyrocopter. 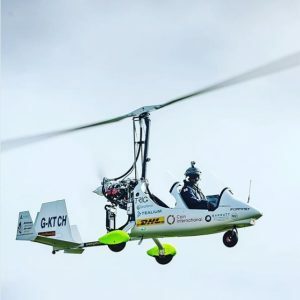 His flight is supported by Trig, his Magni Gyrocopter is equipped with a Trig TT22 transponder, TN72 GPS position source and TY91 VHF compact radio. These products are certified to ICAO aviation standards and meet international mandates, allowing world-wide use. James is the first and only person to have rowed across the Atlantic Ocean, successfully summited Mount Everest and cycled 18,000 miles around the world in what the media dubbed “The Ultimate Triathlon”. On the 31st of March James took off from Popham Airfield in Hampshire. He will fly through France, Germany, Poland, Lithuania, Estonia and into Russia. Crossing the Bering Straits to Alaska, James will then fly across Canada, the USA, Greenland, Iceland, and the Faroe Islands before heading back to the UK. Every kilometer of James’s global flight can be tracked online here. Tracking James’s flight is possible because a Trig transponder and a TN72 GPS is ADS-B Out capable. Automatic Dependent Surveillance Broadcast or ADS-B is a surveillance technology used in Trig transponders. It improves safety, visibility – giving James peace of mind as he flies in both remote and busy airspace. This equipment is affordable, easy to install and can benefit any pilot at home or abroad. James is passionate about helping young people. He plans to visit a school in every country he flies, sharing his adventure, he aims to inspire every young person with the belief that they can achieve their goals and dreams. This reflects his own story, following a serious motorcycle accident James recovered to become the first and only person to have rowed across the Atlantic Ocean, successfully summited Mount Everest and cycled 18,000 miles around the world in what the media dubbed “The Ultimate Triathlon”. James will raise funds for two charities: Kindled Spirit, who support and rehabilitate young victims of human trafficking and slavery; and Over The Wall, who run residential activity camps for children with serious health issues. To add your valuable support please go to James’s just giving page here.